I believe it is essential to get outdoors and be physically active while the weather is good in Ohio -- whether in a park or urban area. I kick my gym members out of the gym sometimes -- and some of them are cheering and others ... not so much. Today is Saturday and we did our Mobilizing Tight Muscles class outdoors surrounded by trees, with the sun peeking over the treetops, with a light breeze, birds chirping and a mix of urban sounds. We use kettlebells a lot during our weekday training, so when we can mix it up with different methods and tools on Saturday, it's refreshing and invigorating. I don't care what you say about fitness; if people aren't having fun, they won't keep it going. So after our stretching class, we trained with battling ropes, wall ball, sledge-to-tire, sled pulls, sandbags moves, jumping rope, handstands, balance on curbs, pistol squat practice and some kettlebell juggling give the nervous system something new to process and a lot of growth and fun comes out of that process. I love watching our members practice, learn and explore functional fitness in different ways. The opportunity for growth is boundless. Interested in joining us? We'd love to have you. Ever since I started teaching strength and movement, I have included play components in personal training and in our small group class programming ... and of course in my own training. I refer to this as Fitness Freedom. We all need time to explore, learn, be free from reps, sets, time and be allowed to challenge our bodies in new and different ways. Any movement or lift can be considered a play component -- Fitness Freedom has less structure and allows the individual to make decisions about whether to push forward or pull back. It needs to be safe, fun, and even a little bit challenging. It may be different than our typical gym programming or it may build on what we do every day. Read my full blog post about Play on Dragon Door. So much is gained from play: besides strength and conditioning ... there is confidence and excitement, in addition to the opportunity to develop (or improve) skills. Ann Morrell is an outstanding kettlebell athlete for many reasons, but here are two: Consistency and Moderation. As a kettlebell coach, this is all I ask of every athlete. From the beginning, Ann has been consistent in coming to class four days a week and she listens to her body to continue to progress and avoid injury -- pushing herself when needed and pulling back when her body tires -- or taking an extra rest day. She came to MoveStrong Kettlebells with a background in kettlebells, so we worked on refining her technique and improving her mobility. Ann is a busy professional who sees this way of training as integral to her life and she understands that moving well is a requisite for strength -- especially when her work days include sitting at a desk. She is joy to coach and she inspires me, our coaches and our gym members with her kettlebell skills and conditioning. 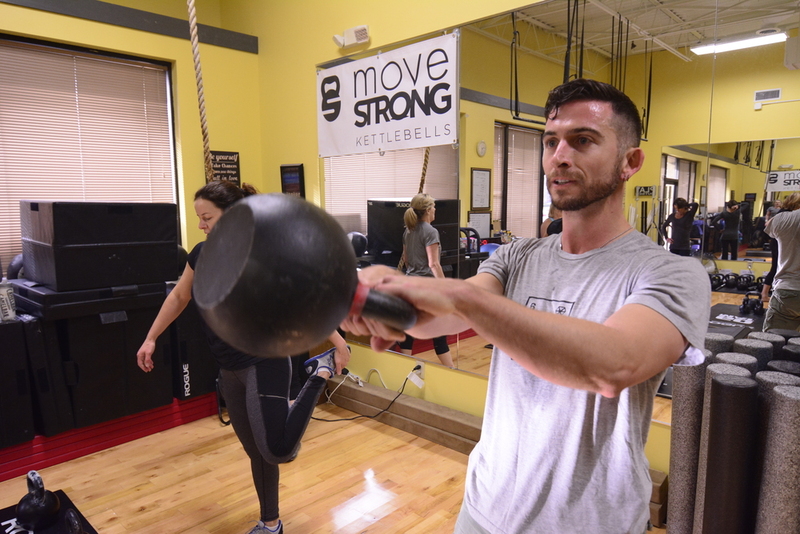 What do you like most about training at MoveStrong Kettlebells? The availability of classes to fit my schedule is so great. And Lori has so much equipment. I like the kettlebell focus with the ability to mix in bodyweight work. The variety of training never gets boring. Lori has deep focus on technique which facilitates regressions/progressions to things I didn't think I could do. She doesn't put limits on what her students can do. It sneaks up on you and you find yourself doing something you thought was out of your reach. What improvements have you seen since training at MSK? I feel stronger and I am stronger because my kettlebell weights have increased -- and I don't think I've maxed out yet. I can do vertical jumps which I was always afraid of doing and I can even hand-foot crawl which I've always dreaded. How does what you do in the gym apply to daily life? I've always worked out and I am not a very happy person when there are disruptions to my workout schedule. The MSK class schedule allows me to come often and stay happy. Is there a moment that stands out for you with a personal best or skill development? I am thrilled that I can do vertical jumps! Why should someone consider training with kettlebells at MSK? One of our practices is to use a foam roller and/or lacrosse ball for myofascial release before every class and afterward as well. Foam rolling / lacrosse ball use mobilizes muscles and fascia and the body sends blood and nutrients to those areas. This primes the body for vigorous physical activity. This practice can help break up adhesions in the fascia that help to loosen up muscles and may help prevent injury. We also mobilize before class with standing or ground-based dynamic body movements such as half windmills and hip-flexor stretches, light kettlebell movements and lifts (such as halos, bottoms up, good mornings, hip openers, t-spine and lat warmers) and we use the TRX and Clubbells in different ways to get the body mobilized we start the kettlebell circuit, chain or complex. We do some static stretching at the end of our training sessions. We especially like the Brettzel, Bretzel 2.0, frog, up and down dog, tailbone to heels after training. No matter how much we mobilize before and after class, focus on perfect technique, and dial in the right volume of lifting and moving during class, muscle twinges can occasionally occur. Many of us have a lifetime of health issues, former sports injuries and mild weaknesses and asymmetries that we are working to improve, so we are diligent about stretching, moving often, resting, hydrating, eating nutrient-dense whole and natural foods and managing stress the best we can. At MoveStrong Kettlebells, we ask members to inform the coaches if an ache or pain pops up at any time. And they are very good about doing so. A muscle twinge can be a tightening, spasm or a slight pain. Whatever it is, we assess what might have caused it. Is it a previously injured area? That is important to know because the most likely place to be injured is the location of a former injury. What movement caused an issue? We may want to leave it alone. We may need to stretch and/or foam-roll it. It depends. It may be something that needs attention from a medical professional depending on the severity and if it keeps popping up. Whatever it is, we take it very seriously. We will always review technique to make sure you are moving with good alignment and with the best technique you can produce for your body. My father-in-law, God rest his soul, did wood-working after he retired. He used to say measure twice cut once because it saves time and energy in the long-run. We do that as well. We address the twinge with great care and attention immediately to prevent it from becoming an injury. Sometimes a couple days of rest now can prevent a couple months off from training to nurse an injury later. If you are training at our gym, and training at home, or at other gyms as well, it makes us less effective as coaches because we are not able to fully manage your programming, training volume and recovery. If this is the case, you will be managing more of that on your own, and you will need to be very careful not to overtrain; overtraining puts you at risk for injury. If something repeatedly causes an issue, we'll adjust or remove it. If lunging hurts your knees due to prior knee issues, but squatting doesn't, squatting is an excellent substitution. However, we will continue to work to get your lunge form corrected with regressions to keep you progressing safely and without pain. If your shoulder is healthy, but you have had prior shoulder issues, and you tell us that you want to skip a certain lift or movement, that is no problem. We can always adapt another movement that will keep you progressing toward your goals. Kettlebells can be a great tool for restoring mobility, stability and strength with the right individualized programming and eagle-eye coaching. Kettlebells are not a cure-all. Picking up heavy stuff is serious business and there is no one-size fits program. Work with an RKC kettlebell-certified coach who has a DO NO HARM philosophy. If there is pain, we refer our members to trusted medical professionals such as Columbus Chiropractic and Rehabilitation to address the issue before it becomes a full-blown injury. We are strength and movement coaches, not medical professionals, so we do not diagnose the issue. Our members are very good about sharing feedback from the day or two before. We ask before every class, every day, how are you feeling? Is anything hurting or feeling abnormal? We ask them not to attend class if they didn't get good quality sleep because it can put them at risk for injury. Mindfulness is required when using kettlebells. Honestly, because hardstyle kettlebells are very safe to use with the RKC methodology/technique, hands-on RKC/HKC coaching, and with appropriately weighted bells, people rarely have injury issues. If something fires up, it is usually a prior injury area that is at risk when technique isn't spot on. It is our job, as coaches, to check and recheck technique and intervene when someone isn't handling a kettlebell correctly. We ask people to put a kettlebell down if the weight is too heavy or the technique is off. That is an act of injury-prevention. This is why you hire a coach ... to keep you safe and safely progressing. We don't care if your heart-rate didn't get up that session because we worked on technique instead of doing a high-intensity circuit. We are teaching you to fish, not giving you fish so technique trumps intensity every time. You earn the right to lift heavy by demonstrating perfect technique for your physique. This is what allows us coaches to sleep at night ... knowing that we did the best we could to keep our gym members safe and safely progressing. Foam roll or mobilize (stretch) the area in question / use biofreeze to temporarily calm the area / or completely leave it alone! Do you have questions or concerns about getting started with us? Contact Lori. We welcome new students post-rehab if you are cleared by a medical professional to train. Thank you Daniel Sparks' for sharing your recent MovNat Ohio experience: I was first introduced to MovNat by Robb Wolf's podcast, Paleo Solutions. I immediately knew I wanted to try it. The idea of moving naturally really spoke to me. After hearing Erwan Le Corre speak with such passion and making MovNat so relatable, as well as Robb Wolf's description of his experience at the workshop in West Virginia, I wanted to sign up. I was more than a bit broken down at the time. Following a Paleo approach was helping, but I was not where I wanted to be yet. I wasn't as strong as I needed nor was my mobility in good condition. I thought MovNat was exactly what I needed. I found a workshop near me and got excited. Prior to the workshop, which was cancelled, my life spun out. All progress I made stopped, and I had to start over. Unfortunately, MovNat was on the back burner. I kept up with the blog and podcast, and discovered the closest trainer was at MovNat Ohio in Dublin, OH. I was visiting family in Columbus, OH and on an impulse checked the MovNat Ohio site. I sent an email to Lori Crock about hopefully training with her on Monday, but I sent the email the Saturday before. Much to my surprise, she responded the same day. A time was set and I was finally going to MovNat! So after less than two years of discovering MovNat I was finally receiving MovNat training. I met Lori at 0600 Monday morning. My first impression was she was extremely fit and looked the part. She met me with a smile, which was impressive at 0600, and she got straight to business. She asked about my goals and what I wanted to get out of the training. This was want I expected from a quality coach. After the paperwork and expectations, we got to work. She didn't just explain what to do in relatable detail, she performed the movements with me. When the warm up and stretching was completed, we moved outside. She worked with me on jumping, throwing, climbing, lifting, running, balancing and crawling. She explained everything and demonstrated the movements with grace and accuracy. Her strength was revealed with the ease in which she preformed all the movements and techniques. If I faltered on a movement, she had me make corrections and encouraged me to continue. I had attempted MovNat techniques before based on videos off the Internet, but having Lori's coaching made a huge difference. I actually climbed a tree! I was able to make corrections to my movements throughout the morning. My mobility improved. My movements felt easier. I felt better. This was working! In just over two hours, my approach to training had changed, and for the better. I would highly encourage anyone seeking to improve their fitness and health, to sign up at MovNat Ohio! Lori is an excellent trainer and coach. She has far more to offer than just techniques on movement. Her whole approach to coaching encompasses the total picture of health. I was very pleased and impressed by my experience. After 15 years of Law Enforcement, and 11 years as a Defensive Tactics instructor, I believe MovNat Ohio offers great training which is completely useful in everyday life. You will increase your strength, improve your mobility, become more flexible and truly enjoy yourself. I highly recommend training with Lori. I am now hooked and I look forward to returning for more. I have been through several great training programs, both LE and civilian, and MovNat Ohio is one of the best. Some very forward-thinking yoga instructors, Eric and Chelsea from Solaluna Yoga, had us in recently to teach MovNat to their community in beautiful Oberlin, Ohio. See the photo gallery at the end of this story. Even though balance is a strength for yoga trainees, everyone enjoyed the challenges MovNat balance practice imposed with the dowell thow-and-catch, walking over and under obstacles and through the hula hoop and balancing with a squat and lunge. Lifting and carrying is very practical skill we teach-- whether we are lifting/carrying sandbags or people. Another favorite are the variations of the foot-hand crawl -- and trainees are always surprised at how difficult it can be to master the various crawl techniques that came so naturally when we were babies. The highlight of the day was our trip to the local playground. How often does a group of adults get to enjoy a lovely Sunday afternoon climbing trees, jumping on and off a giant turtle, hanging from the monkey bars and testing out their newfound efficient movement skills including the jump-over-human-to-front roll? Smiles everywhere. And because we had to get to the playground somehow, we practiced our forefoot running on the way -- on the way back we jumped over benches and balanced on curbs, movnat-style, with nary a nod from anyone. Oberlin is a college town after all. To play with purpose -- explore movement using MovNat, sharing stories, tweaking our running form, using our bodies to move in new ways, laughing and being physically active without reps, sets, machines or even any rules (except to be safe and try some of the skills) is all that we ask. On days like this, I do have the best job in the world ... helping people learn to look at 'exercise' and health in a new way with freedom, excitement and pure fun. In our competitive world, people find the collaborative nature of MovNat refreshing. We encourage each other and share in each other's triumphs while practicing the skills. When someone masters an elbow swing up over the bar, we're all sharing in it, and in fact, we feel like we are really right up there with them. Different ages can practice together and each be challenged. We had a family in the workshop with a 10 year-old boy ... and it was so interesting to hear the 10-year-old' perspective on movement (it's so simple, it's a bear crawl!) and his favorite movement was the jump with a slap landing. We had a couple trainees preparing for the Tough Mudder and we gave them lots of practical movement tips and techniques to help them prepare for the 12K grueling obstacle course next weekend. I don't think many fitness sessions leave people feeling energized and so happy afterward. Okay, maybe we are a little sore the next day, but while we are in the midst of it, it is nothing but fun and community building and for a period of time, we leave the rest of the world out of our minds. Thanks to Solaluna for hosting us! We enjoy giving private workshops at fitness studios, to corporate groups and non-profit organizations. Contact us for more information. I was interviewed by a news reporter recently for an article in The Columbus Dispatch about competitiveness in the gym. Read the story here. I felt like I had a split personality as I was talking to the reporter ... because while I consider myself a collaborative person, when I am really honest with myself, I see that my true nature is, well, competitive. So what does this mean in terms of daily fitness training? I think it means that we should accept our true nature, but I also think that most people can benefit from a mix of competition and collaboration in fitness. MovNat is collaborative, but in a MovNat team-building event recently, after working collaboratively, we created some friendly competition by splitting into teams for a little tug-o-war. The group was hungry for it. Here are some questions to ponder if you consider yourself a competitive person and struggle with that a bit (like me). 1. What is your true nature? Don't fight your true nature; work with it. But definitely fine-tune it appropriately for the people you are with and for the situation. In terms of competing with my husband, I do that at times where it makes sense -- when it's just the two of us training and with appropriate fitness tools. We don't compete in areas that would be unsafe or there is a ridiculously large difference in our skill levels. 2. How do you use competitiveness for good? Keep it in perspective. Be safe and progress appropriately. Listen to your body. Have fun and keep a light spirit -- a good challenge can keep you progressing, but don't let it get out of control or someone could get hurt -- when form falls apart, the competition is over. 3. When is collaborative and/or competitive appropriate? I think collaborative and competitive work together on and off all the time. Helping each other, correcting form, reminding the other to hydrate, stretch, spot a lift ... that's collaborative. Wanna see how many Kettlebell swings we can do in a minute? That's competitive, but in the case of hubby and me, we are competing with ourselves and each is using Kettlebell weights appropriate for our individual skill level. 4. Can you achieve good results without competition? For sure. We do it all the time. Working together toward a goal is fun. Shouldering a log together ... one day we ran up a hill side-by-side carrying heavy rocks -- fun and challenging -- we told ourselves "this is not competitive," and it felt great to laugh and move fast. Although, I have to admit ... I was racing him ... as I always do ... and I can promise you ... he was racing me too. Do you tune in to your true nature and use it for good?